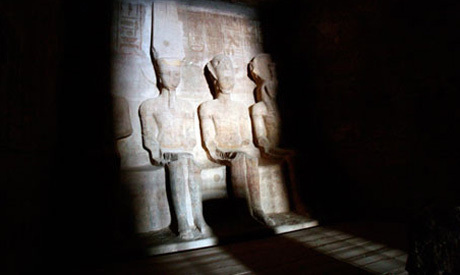 A large number of tourists gathered on Thursday to watch the sun’s rays illuminate the sculptures in the Great Temple at Abu Simbel in Aswan, an occasion that happens twice a year. The ceremony was attended by a number of state and archaeological Egyptian and foreign officials amid tight security measures. But, twice a year, on February 22, Ramses II’s birthday, and again on October 22, a day celebrating his coronation, sunlight illuminates on the seated statues of the sun gods Re-Horakhte and Amon-Re, as well as a statue of Ramses II. The statues sit in the company of the Egyptian god of the underworld, Ptah ,who remains in the shade all year.